Offense doesn't get going until it's too late against one of the league's worst defenses. ATLANTA — After being asked about so many downs that disintegrated during Monday night’s loss to the Falcons, along with a handful of unorthodox decisions intended to spark something — anything — from the Giants’ moribund offense, Pat Shurmur had had enough. “Anybody want to ask me about a good one?’’ the coach said. The request was met with awkward silence. Their inability to find the end zone on a regular basis — on Monday night in particular against a porous Falcons defense that was allowing the second-most points in the league — has sunk them to 1-6 with four straight defeats. The Giants’ 23-20 loss to the Falcons at Mercedes-Benz Stadium was the latest example of ineptitude, combining questionable play-calling, unacceptable pass protection and just plain old stinky football. The Giants reached the red zone on three straight possessions late in the first half and into the third quarter but came away with just a pair of field goals. With a chance to tie the score, they turned it over on downs after Manning’s fourth-and-goal pass from the 1 intended for Scott Simonson fell incomplete. The defense did a good job for most of the game but allowed three plays for a total of 113 yards that broke them. Two were back-to-back late in the second quarter — a 36-yard completion to Austin Hooper with B.W. Webb draped on him followed by a 47-yard touchdown pass to a wide-open Marvin Hill on a busted coverage by Janoris Jenkins that gave the Falcons a 7-0 lead. The other was a 30-yard touchdown run by Tevin Coleman in the fourth quarter that put the Falcons ahead 20-6. Even with all the bumbling, the Giants made it interesting late. Saquon Barkley scored on a 2-yard run with 4:47 left to bring the Giants within a possession at 20-12. Shurmur called for an unorthodox two-point conversion and Beckham was open in the end zone, but he dropped it. That left the score at 20-12 and the Giants needed a stop. Instead, the Falcons kicked a 56-yard field goal with 1:55 left to go back up by two possessions. 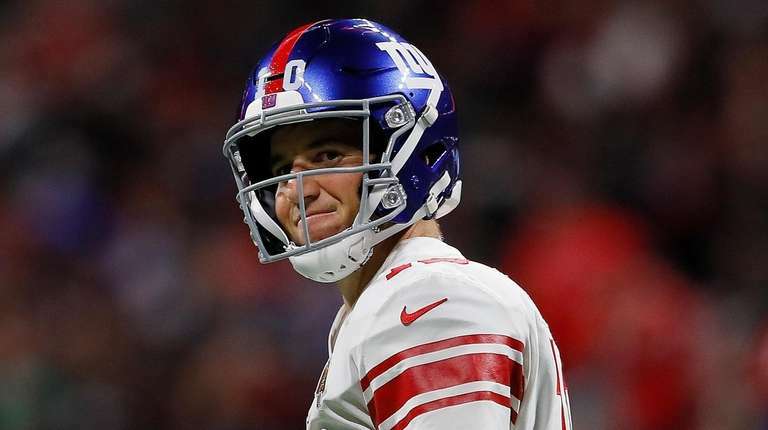 Manning hit Shepard with a 58-yarder with 1:40 left and the Giants reached the 1 on a third-down pass to Rhett Ellison with about 45 seconds left. Manning ran a pair of unsuccessful quarterback sneaks as the clock ticked away before finding Beckham in the end zone with five seconds remaining. Barkley ran in the two-point conversion. Had the Giants scored even one play earlier, never mind the time-wasting two pileups that resulted in no gains, they could have at least attempted a traditional onside kick. Instead, they had to squib the kickoff, and the Falcons recovered it to seal the win. Close, though, is getting old. Maybe when that happens, someone will ask Shurmur about the good plays. Until then, they’ll continue to be overshadowed by their failing counterparts. Eli: We need to turn around red zone failuresATLANTA -- Eli Manning completed 27 of 38 passes for 399 yards and a touchdown ... Barkley: 'I didn't play a good game'Saquon Barkley was upset about the loss, but also about what he felt was his role in it.